Join the live broadcast of BBC Radio 4’s Woman’s Hour from the V&A, where the winner of the Woman’s Hour Craft Prize will be announced. 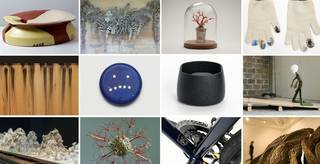 Bold, beautiful and brilliantly diverse, works by the 12 finalists of the Woman’s Hour Craft Prize provide a snapshot of contemporary British craft practice, and how it engages with the world today. The winner of the £10,000 Prize will be selected by Rosy Greenlees, Executive Director of the Crafts Council, Tristram Hunt, Director of the V&A, Martha Kearney, BBC journalist and broadcaster, and fashion writer Susie Lau. on the day to be seated by 9.30. Latecomers are not permitted. In collaboration with BBC Radio 4 and the Crafts Council.